Green Tech Carpet and Tile Cleaning provides high quality service to both residential as well as commercial customers in the Tarpon Springs, Florida Area. We understand that carpeting provides warmth and comfort to your Tarpon Springs, Fl home. 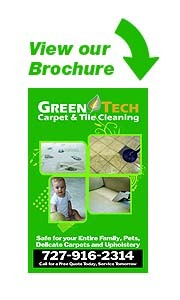 Green Tech Carpet and Tile Cleaning is ready to provide the highest quality care for your carpet. Regular professional carpet cleaning not only extends the life of your carpet your also have the benefit of enjoying clean fresh healthy carpet in your Tarpon Springs home. Steam carpet cleaning is the preferred method of cleaning by most carpet manufacturers. Using a professional carpet cleaning company, you can protect your carpet from discoloration due to heavy soiling and spills. Green Tech Carpet and Tile Cleaning can help you extend the life of your carpet by years in your Tarpon Springs, FL home. Our carpet cleaning method will remove heavy spots and rejuvenate your carpet- restoring it and keeping its color vibrant. Our carpet cleaning experience is both professional and efficient. When we are done, you will forget that your carpet was ever soiled, and you will enjoy the new-looking carpet that was there all along. Steam Carpet Cleaning in Tarpon Springs, Florida. Steam carpet cleaning, also know as hot water extraction is the most effective carpet cleaning method available for the consumer. When utilizing the method of steam carpet cleaning, a fine spray of very hot water is injected into the carpet pile, which agitates dirt, dust mites, pollen, stains and other particles loose. This super heated, highly pressurized water, in combination of the addition of green cleaning solution will further loosen these particles from much deeper within the carpet than other methods of carpet cleaning. Steam carpet cleaning is the most effective solution for allergy sufferers, it removes many allergens including dust mite and dander from deep within the carpet. Quick Dry Time with Powerful Truck Mount Vacuum. As the water is sprayed into the carpet, a powerful truck mounted vacuum will extract the water along with all the dirt and allergens. The benefits of using extremely hot water, 220 degrees, and powerful vacuum is 95% of water is immediately removed during this recover process. In addition we also use powerful air movers during and after the carpet cleaning ensuring the carpet in you Tarpon Springs, FL home is dry within a few hours. Green Tech's Carpet Cleaning Method In Tarpon Springs, Florida. This pre-inspection helps us determine the source of the stain, enabling us to choose the best stain-lifter for your carpet's condition. We also want to know of any concerns you have with any other service providers and will discuss how we can avoid them. If necessary, we will then pre-vacuum the carpet if you have not already. Most Tarpon Springs, Fl homeowners usually we do this before we arrive. Next we will pre-teat spots and traffic lanes. Traffic lanes are where the carpet is usually most soiled and will need special treatment as well as pile nap restoration. We use a very safe, but effective green carpet cleaning solution at this point. This solution is sprayed directly into the carpet and allowed to dwell. 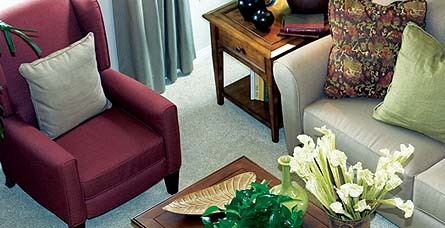 During this dwell time the solution is penetrating the carpet fiber and loosing all the accumulated soil. The next step, agitation, is very important and ofter over looked by most other carpet cleaning companies. While the green carpet cleaning solution is still wet on the carpet surface, we will then use a special brush that will further work the solution deep into the pile ensuring that the carpet is prepared for the hot water extraction process. Hot Water Extraction, Steam Cleaning. Now the carpet has been completely conditioned and the spots and soil have been suspended in the carpet fibers we can begin the hot water extraction process also know as steam carpet cleaning and is the best possilbe carpet cleaning method for your Tarpon Springs, Florida home. Part of our truck mounted cleaning system is a 365,000 btu on demand hot water heater. This heater is able to generate and maintain a constant heat of 220 degrees. This super heated water is pumped at 400 psi to a jetted carpet cleaning wand or rotary tool. This extremely hot water is injected in the carpet and immediately removed in one continuous action. The hot water kills dust mites and other allergens on contact. These allergens along with the soil are then vacuumed directly into a holding tank on our truck for later disposal. This leaves behind sanitized, allergen free clean carpet. Because of the high heat and powerful vacuum your carpets are dry and ready for use in a few hours. Also during and after the carpet cleaning process we use high volume air movers which also aid in delivering dry carpets within hours.